Purple daikon radish has a typical root shape that is globular and tapers to a point. 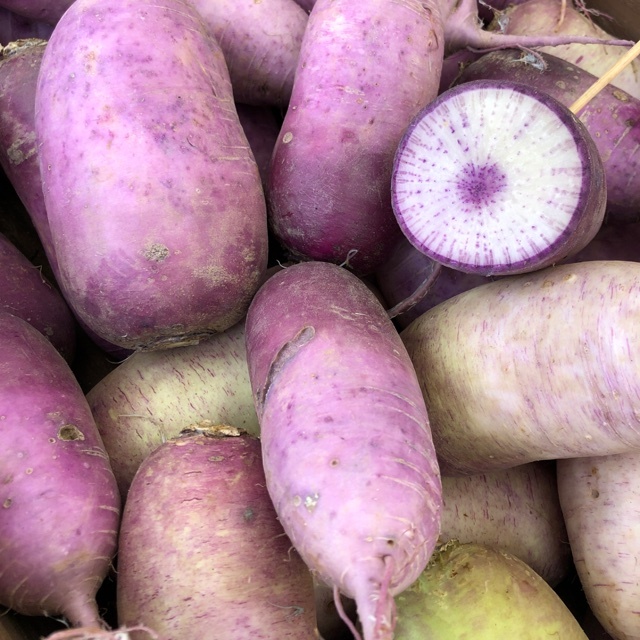 This variety of daikon can be recognized by its bi-coloring that is a violet purple on its exterior and a bright white to pale violet on its interior. The inner flesh is very crisp and offers a mild to medium heat and classic daikon radish flavor. When grown in a cool climate Purple daikon will be mild, when grown in warm to hot climates the radishes will develop a more intense heat. Purple daikon radish are available in the early spring and fall months. The Purple daikon radish is botanically classified as Raphanus sativus var. longipinnatus and is a member of the Brassicaceae or mustard family. The word ‘daikon’ is Japanese for “great root”. Daikon radish is a cool weather root vegetable grown primarily for its tuber though the entire plant is edible. The most commonly grown variety of daikon radish is large and white though limited availability can also be found in varying hues of red, pink, black, and purple as well. Purple daikon radish is an excellent source of fiber and vitamin C, particularly when eaten raw. Additionally they contain flavonoids and the antioxidant sulforaphane. Purple daikon also contains vitamin B6, folate, and minerals such as K, Ca, Mg, and iodine. The leafy greens of the Purple daikon are edible and offer a significant amount of vitamin C as well. Purple daikon radish can be used in both raw and cooked applications. Sliced thin they can be added to salads, slaws and sandwiches or served atop sushi and sashimi. When grated the Purple daikon can be used as a condiment. Thin slices of Purple daikon are also popularly added to stews, curries, broth and soups such as miso. Both the leaves and root of Purple daikon are popularly sliced and pickled as well. 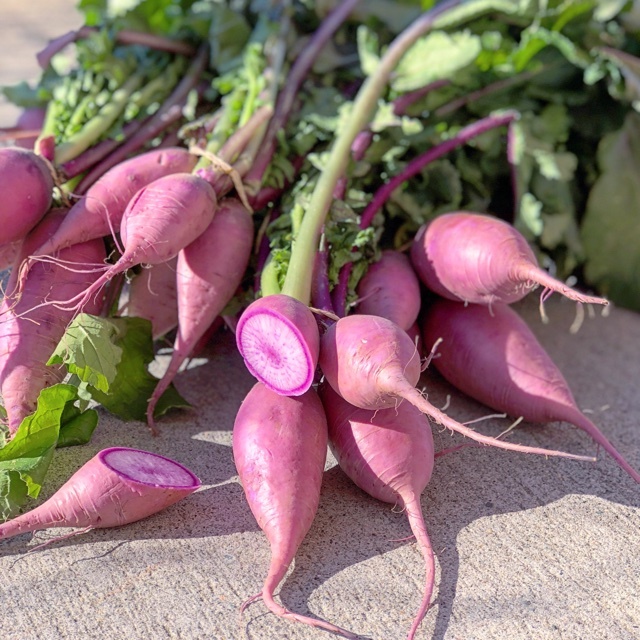 Purple daikon radish can also be prepared roasted which will tame the spicy bite radishes are known for and impart a caramelized flavor. Additionally the leaves of the Purple daikon can be consumed and used in salads, soups and stir-fries. To store, keep Purple daikon radish roots in the refrigerator and use within one week. For longer storing Purple daikon radish should be stored in a cool, dark place such as a root cellar. The leaves of daikon radish such as the Purple daikon are used in the popular pickled Korean condiment known as kimchi. 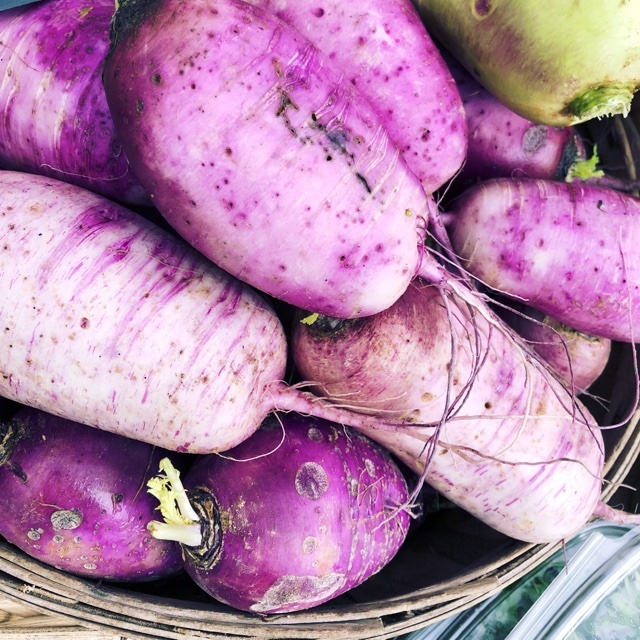 In Japan the root of daikon radishes such as the Purple daikon are known for their high vitamin C content as well as for their enzymes which have natural decongestant properties. As a result grated Purple daikon combined with honey is used to make a natural cough syrup. Daikon type radishes are native to Asia where they have been cultivated for thousands of years. The earliest radishes known to man were dark colored and large, evidence of them can be found dating back to 2780 BC Egypt where they are thought to be consumed by the workers building the pyramids. In Japan today daikon type radishes are the most commercially produced vegetable grown. The Purple daikon is a specialty radish type found when in season at farm stands and specialty stores. It is more commonly found in Asian countries though it can occasionally be found in the United States when in season as well. Recipes that include Purple Daikon Radish. One is easiest, three is harder. People have shared Purple Daikon Radish using the Specialty Produce app for iPhone and Android. Sharer's comments : Purple Daikon Radish spotted at Ballard Farmer's Market. An excellent source of Vitamin C and a natural decongestant. Fantastic sliced with a little fresh lemon and dill! 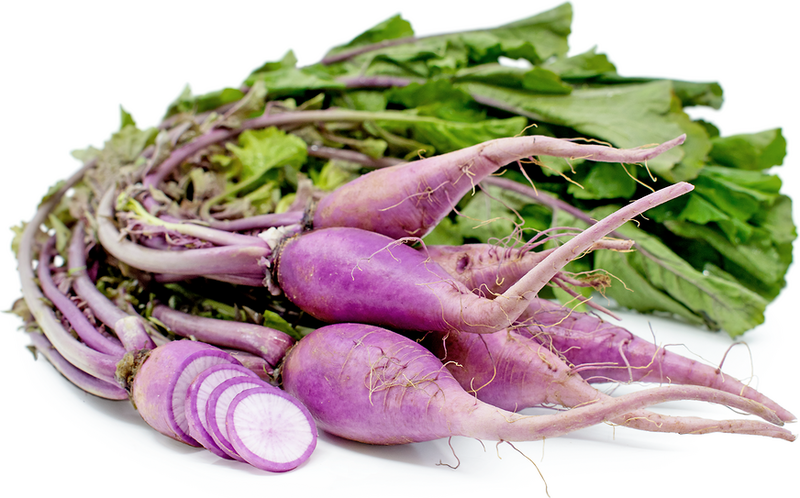 Sharer's comments : Purple Daikon Radish spotted at University District Farmers Market. Beautiful violet daikon radish with mild to medium heat! 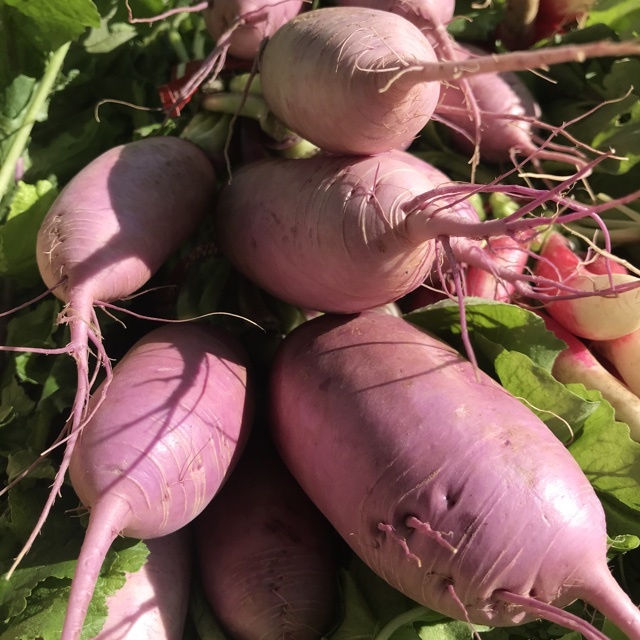 Sharer's comments : Purple Daikon Radish spotted at Vista Farmers Market. 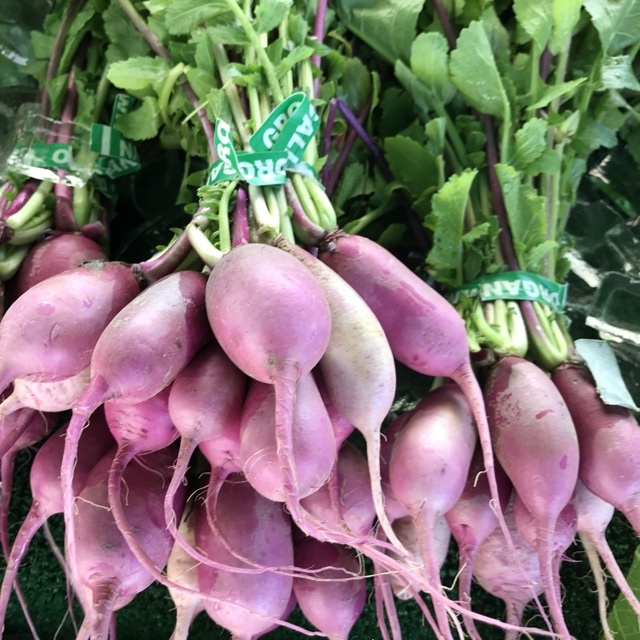 Sharer's comments : Purple Daikon Radish spotted at Little Italy Mercato. 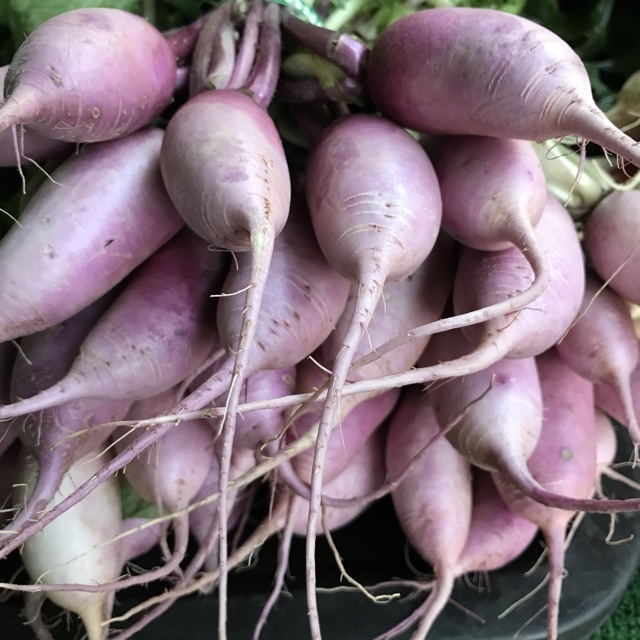 Sharer's comments : Purple Daikon Radish spotted at North Park Thursday Market. 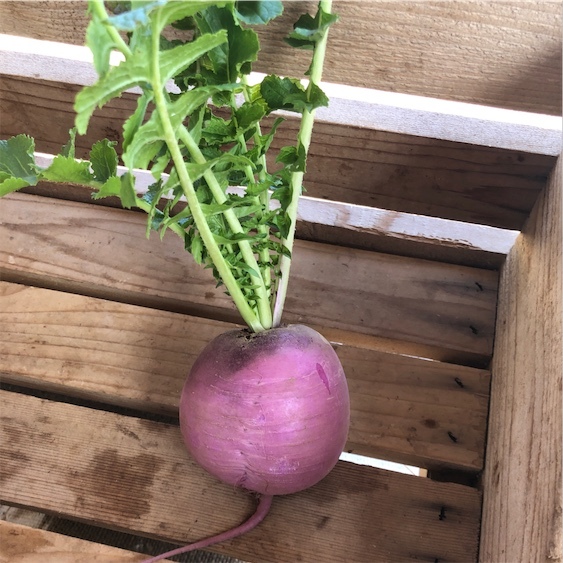 Sharer's comments : Purple Daikon Radish spotted at Specialty Produce. 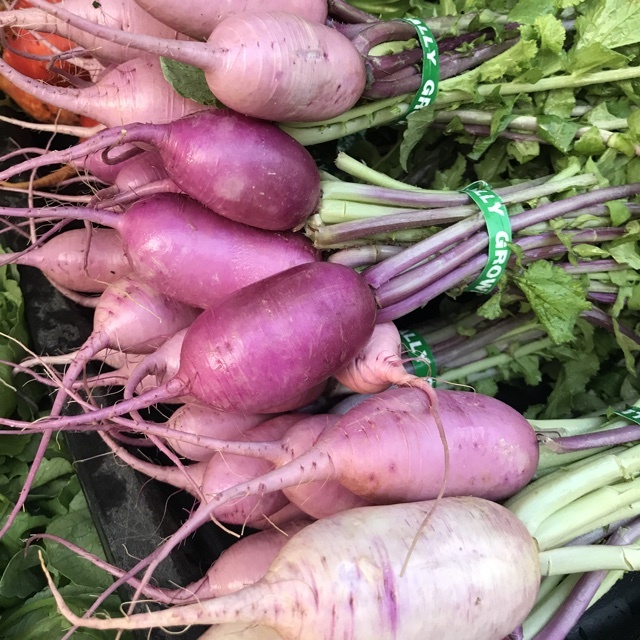 Sharer's comments : Purple Daikon Radish spotted at Little Italy Mercato. Very nice quality.